Due to upcoming renovations, the Beinecke Library's reading room will close at 4:45 pm on Friday, May 8. The public exhibition space will remain open through Monday, May 18. A temporary reading room will open on Tuesday, May 19, in the Franke Family Reading Room in Sterling Memorial Library. It will operate throughout the renovation, though access to some collections will be limited. There will be no access to Beinecke collections from May 9 until the temporary reading room opens. All the latest details about the renovation and closing times can be found here. Remi Castonguay and Suzanne Lovejoy from the Gilmore Music Library, and Brian Meacham, Archive and Special Collections Manager at the Yale Film Study Center, will present on an Arcadia-funded project entitled: Preserving Films in the Benny Goodman Archive. The Benny Goodman Archive is an amazing special collection in the Gilmore Music Library and part of it is composed of 16 and 35 mm films that were in serious need of preservation treatment. The films mostly date from the 1950s with contents ranging from home movies, to Hollywood feature excerpts, television broadcasts, and documentary footage. This presentation will provide an historical overview of the Goodman Archive to put the films into a larger context. Then, we will discuss some basic aspects of film preservation and the challenges this collection presented. Most importantly, we will provide an overview of the film collection’s contents through the projection of numerous excerpts. Join us for this exciting opportunity to watch some rarely seen footage. BYO Popcorn! All welcome! This talk is sponsored by SCOPA. Thanks to the generosity of donor Ravi D. Goel (Yale College, 1993), Manuscripts and Archives has received a collection created by Henry Roe Cloud, the first self-identified Native American to graduate Yale University. Henry Roe Cloud was born on a Winnebago reservation in Nebraska in the mid-1880s. Like many Native American children born on reservations in that time period, Cloud went to an Indian school to learn how to read and write in English as well as a trade. Cloud was an exceptional student, moving on to a private boarding school in Massachusetts before starting Yale College in 1906. While at Yale, he was adopted by the Roe family, missionaries that spent some of their time preaching among Native Americans. He received his bachelors in psychology and philosophy in 1910 and his masters in anthropology in 1914. He became a Presbyterian minister, an official within the Office of Indian Affairs, and a lifelong advocate of modern education for Native American youth. Manuscripts and Archives already holds a collection with some of Cloud’s letters in the Roe Family Papers (MS 774). 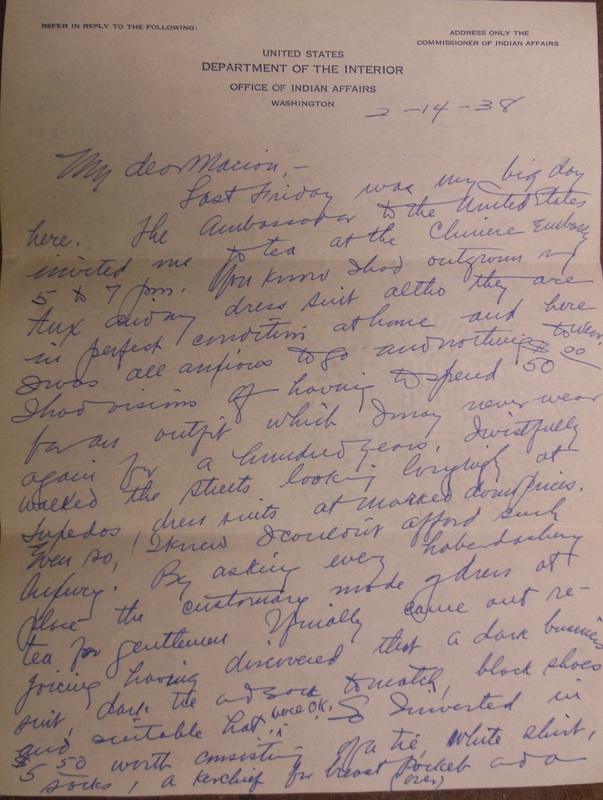 However, with this new collection, we received more correspondence, including a set of letters addressed to Cloud’s daughter, Marion Roe Cloud Hughes. The letters were written when Cloud was traveling on behalf of the Office of Indian Affairs. One letter in particular stood out to me because of its familiarity of situation to most: being stuck at a fancy party, unsure what to do. That’s not to say that Cloud was particularly shy. At Yale he was part of a fraternity (Beta Theta Pi), the debate club, and the Elihu Club. He also regularly talked to people in the course of his work. However, it must have been daunting to be invited to tea with the ambassador to the United States at the Chinese embassy. While Cloud and the ambassador were classmates at Yale together, this was still a far more formal event than Cloud was used to. Getting to the tea was the first difficulty as neither Cloud nor the taxi driver had change for Cloud’s five dollar bill. Cloud wound up having to ask around the embassy for change before giving the driver $3.00 for a 50 cent fare. When he finally entered the embassy and was received by the ambassador and one of his daughters, Cloud was not quite pleased when the ambassador commented on “how stout” Cloud was and asking what Cloud ate. Embarrassed, Cloud found himself moving on and then lost amongst the 400 or so guests. While the party probably didn’t go as Cloud would have liked, at least he had an adventure to relate to Marion. We now also have the letter so we can share in it as well. 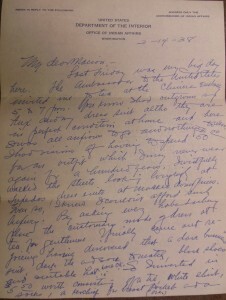 The first page of Henry Roe Cloud’s letter to his daughter Marion. Researchers interested in seeing the Ravi D. Goel Collection on Henry Roe Cloud (MS 2008) can now do so via the finding aid located here. To learn more about using Manuscripts and Archives collections, you can visit our website here. This talk on Thursday–the latest in the Day of Data series–will examine a computer simulation recreating the universe from the Big Bang to today. We live in a remarkable era. We can directly see how our universe has evolved over time in the past 13.8 billion years after the Big Bang. Today, we use astronomical observations and computer simulations in combination to test some of our wildest imaginations about what our universe is made of and how it began and evolved over the cosmic time. In this lecture, Daisuke Nagai will describe the state of affairs on our understanding of the universe and how computational modeling plays an essential role in interpreting ever-growing astronomical datasets of galaxies, stars, and planets and addressing some of the most confounding questions about our own universe. Daisuke Nagai is an Associate Professor of Physics and Astronomy at Yale University. His research interests lie in the area of cosmology and astrophysics, specializing in theoretical and computational modeling of the structure formation of the Universe and its application to cosmology. Opening hours in Bass Library and Sterling Memorial Library have been extended in the coming weeks. Between April 24 and May 4, Bass Library will remain open until 2:45 am Sunday-Thursday, and until 11:45 pm on Friday and Saturday. Bass will also open early at 10:00 am on Sunday. Sterling will remain open until 11:45 on April 24, April 25, and May 2. To view the daily hours for seven of Yale’s libraries, access the Library homepage. From the homepage, follow the links at “Today’s Hours” to see hours for the entire week at all libraries. The staff and collections of Oral History of American Music (OHAM) have moved from their previous location on Prospect Street to Sterling Memorial Library (SML). OHAM’s director, Libby Van Cleve, is now located in a reconstructed office in room 332 on the third floor of SML. Adjacent to her office is the work area for OHAM Assistant Maura Valenti and student workers, as well as the audio workstation and the OHAM collection. OHAM’s Research Archivist, Anne Rhodes, and Founder, Vivian Perlis, have moved to a new office located in the Irving S. Gilmore Music Library. This affords easy public access that will facilitate the work of OHAM’s many users. OHAM was founded in 1969 with a pioneering study of Charles Ives conducted by Vivian Perlis. During its first decades of existence, it was affiliated with the Yale School of Music, and offices were located in Stoeckel Hall. In 2006, it moved to a location on Prospect Street, the first floor of a former stately home. The offices were gracious and elegant, but far from central campus. In 2010, OHAM became an official component of the Gilmore Music Library, part of the Yale University Library. The move to SML situates OHAM just down the hall from the Benjamin Franklin collection, the Boswell Papers, and the Fortunoff Video Archive for Holocaust Testimonies. The collection will be more easily accessed, and the OHAM staff will be better able to use library services and to take part in the larger central campus community. Oral History of American Music is the preeminent project in the field of music dedicated to the collection and preservation of oral and video memoirs in the voices of the creative musicians of our time. It is a special kind of history, one that captures sights and sounds and recreates the spontaneity of a moment in time. Over 2,500 audio and video recordings make up this unique and valuable collection. Sunday, April 26 at 4:00pm at the Joseph Slifka Center for Jewish Life at Yale, 80 Wall Street. This recital is in honor of the 25th anniversary of the endowment of the Joseph and Rosalyn Newman Yiddish Collection at the Yale University Library. It will be performed by Yale students with accompaniment by Jay Gitlin on the piano and Vinny Oneppo on the clarinet. The recital will be preceded with talks given by Mark Slobin, the Winslow-Kaplan Professor of Music at Wesleyan University, who will speak on "Yiddish Sheet Music in the Tenement Era"; and Dr. Michael Ochs, retired Richard F. French Music Librarian at Harvard University and senior lecturer on music, who will speak about "Tailoring an Operetta to Its Audience: Joseph Rumshinsky’s Di goldene kale (1923)". The event is sponsored by the Yale Library Program for Judaic Studies, the Irving S. Gilmore Music Library, the Yale Program in Judaic Studies, and the Slifka Center for Jewish Life at Yale. The recital and talks will be followed by a reception to which all are welcome. In conjunction with the new CSSSI media exhibit "Anthropology at Yale", Professor Claudia Valeggia will share aspects of her current research on the biological and cultural correlates of life transitions among the indigenous Toba/Qom people of northern Argentina. She is the Director of the Chaco Area Reproductive Ecology Program and the Co-director of the Reproductive Ecology Laboratory. A reception will immediately follow her talk and all are welcome! "What is the actual historical relation between close reading and non-close or 'distant' methods of textual analysis? This talk demonstrates that I. A. Richards’s inaugural theories of close reading were shaped by his era’s statistical analyses, particularly the genre of the frequency-based word list. Recovering an important chapter from the history of literary studies that has eluded digital humanities discourse, this talk hopes to enrich our understanding of the digital humanities as well as close reading by looking to the former’s pre-digital history." Three New Chinese databases available! 2. China Yearbook Full-text Database 中国年鉴全文数据库http://oversea.cnki.net/Kns55/brief/result.aspx?dbPrefix=CYFD provides detailed, timely, comprehensive and systematic access to authoritative facts, statistics, activities and events of national and regional significance. Yale subscription now includes (F) Literature/History/Philosophy, (G) Politics/Military Affairs/Law, (H) Education & Social Sciences and (J) Economics & Management. Pishu, which literally means "cover-books," are high-value analytical reports intended to guide policymaking in the People's Republic of China. These reports feature exclusive research and analysis by the prestigious Chinese Academy of Social Sciences and authors from similar institutions, and present objective analysis versus official government messaging on strategic issues. The resources have been added to the Library’s Orbis online catalog, Find a Database by Title, and Chinese Studies subject guide.